Extension faculty at CLEAR are creating Story Maps for their projects, inspired by the successful maps of Emily Wilson. Dave Dickson has created one, called the State of Low Impact Development in Connecticut, which describes the results of research done over the summer of 2015 by CLEAR’s NEMO Project on the use of “low impact development” practices in Connecticut towns. The Story Map not only tells a compelling story, but also can be used as a research tool by town planners and others, since the interactive maps provide direct links to various town documents that pertain to low impact development. 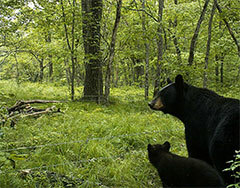 Cary Chadwick worked with CAHNR graduate student Mike Evans to create The Bears are Back, a Story Map on his research investigating the growing population and distribution of black bears in Connecticut (photo here, wildlife camera traps were set up at several sites to catch digital photographs of visitors to the site). Emily has created another Story Map with Extension Educator Joel Stocker, called Explore Connecticut’s Changing Shoreline, which looks at historical changes to Connecticut’s coastline from 1934 to the present by carefully comparing historic and current aerial imagery. CLEAR’s Extension crew are confident that this new technology will help them to bring their research and outreach efforts to an ever-growing audience. View all of the Story Maps at: clear.uconn.edu/storymaps.